The Indian whisky, produced by Allied Blenders & Distillers, saw sales decline by 5% last year, but remains more than seven million cases ahead of second place McDowell’s No.1, owned by Diageo’s Indian subsidiary United Spirits. Pernod Ricard’s Imperial Blue and Royal Stag are the third and fourth best-selling brands with 18m case sales each in 2016. 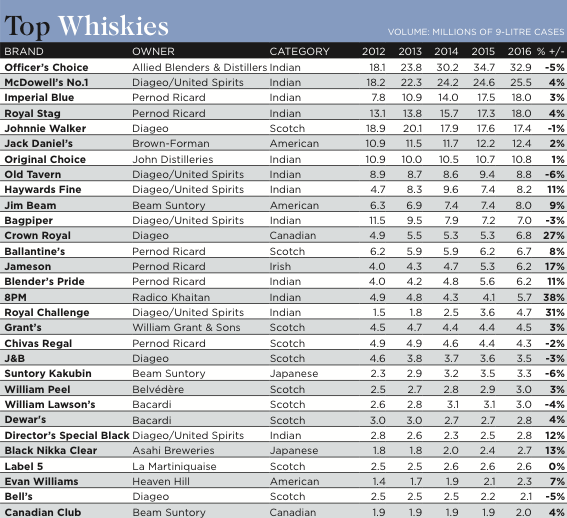 Meanwhile Diageo’s scotch Johnnie Walker, which in 2012 was the world’s top selling whisky, drops to fifth in the list. Seven of the top ten whiskies are from India, with two from the US (Jack Daniel’s and Jim Beam) and only one from Scotland.